The goal of this workshop is to bring together mathematicians and data scientists to participate in a discussion of current methods and outstanding problems in data science. The workshop is particularly aimed at mathematicians interested in pursuing research or a career in data science who wish to gain an understanding of this rapidly evolving field and the ways in which mathematics can contribute. Researchers currently working in data science are also encouraged to attend, to share ideas about mathematical methodologies and challenges. A number of experienced data scientists with a variety of backgrounds from academics, national laboratories, and industry (including startups) will be invited. The program will include overview and technical talks, several panels consisting of practitioners with different experience levels, and one or more poster sessions. Image created by Nurcan Durak and provided courtesy of Tamara Kolda. The image to the right is an illustration of the BTER (block two-level Erdös-Renyí) graph model. The nodes are color-coded: darker nodes are of higher degree. 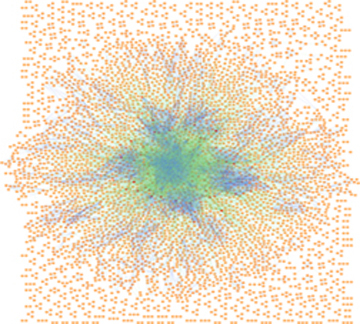 The blue edges correspond to highly-connected affinity blocks, and the green edges to “random” connections. Image created by Nurcan Durak and provided courtesy of Tamara Kolda, based on work at Sandia National Laboratories*. * Sandia National Laboratories is a multi-program laboratory managed and operated by Sandia Corporation, a wholly owned subsidiary of Lockheed Martin Corporation, for the U.S. Department of Energy's National Nuclear Security Administration under contract DE-AC04-94AL85000.